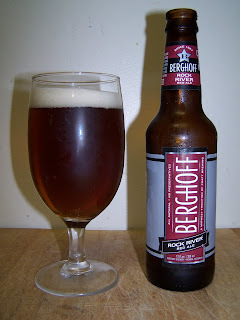 Pours a nice dark amber almost maroon color with rich copper hues, the head white to off white and somewhat soapy. The head diminished quickly but left a nice ring around the top of the beer with some lacing. It’s a clear filtered beer with lots of carbonation, it’s dark and hard to see through but you can see lots of tiny bubble coming up from the bottom of the glass. Nice pleasant aromas on the nose. Malts and hops are subtle but both are present. There is a nice caramel sweetness present also. It really smells good I can’t wait to dive into this one. Nice, first impression on the taste, it really taste every bit as good as it smells. The high carbonation adds to a clean refreshing mouth feel to this beer. The sweetness of caramel maybe even slightly roasted notes with also a nutty taste to it. There is a slight unpleasantness on the back end but it does not linger and it finishes fairly dry with some lingering maltiness. As this beer warms up that unpleasantness on the back end is a little more pronounced. I wish I knew more about this so I could describe it better. All and all this is a very good American amber or red ale. Smooth rich malts with just the right amount of hop balance to give you a clean finish. I would recommend this beer to anyone that likes a little more body to a beer but not too heavy. My final rating for this beer is a B-. If I was comparing several American ambers head to head this one may drop to a C or C+ but I’m going to stick with a B-. A good beer nothing outstanding but more importantly nothing really bad either. There is that slight thing on the back end but that’s not enough to give it a really bad rating. It’s an overall good beer. Something comparable to this and widely available would be the Budweiser American Ale. Yes, I said Budweiser; their new American Ale is a very good around amber ale. And you can’t beet it for the price it’s only about $6.00 a six pack. I’ll have to do a real review of Bud’s American Ale.